Direct from the development studios of Net Entertainment is this online slot machine based on an expedition deep into a damp and steamy jungle – the home of various scary animals and unnerving sounds. It’s called Jungle Spirit: Call of the Wild, it comes with three different bonus features and you can find out how to play it below. 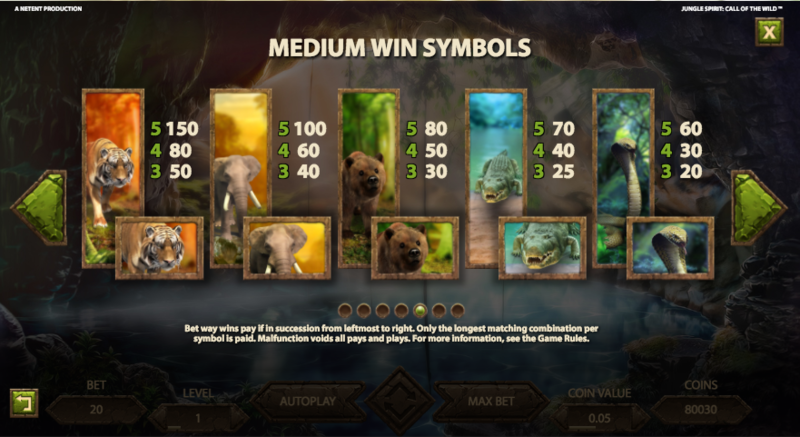 Jungle Spirit: Call of the Wild is a five reel slot with three rows and 243 ways to win; the jungle setting is appropriately atmospheric and your gameplay will be enhanced by the sounds of native drums and animal squawks. The five higher value symbols are beautifully rendered pictures of animals – a tiger, an elephant, a bear, an alligator and a cobra; lower values are 10, J, Q, K and A but carved out of stone. There is no wild symbol in Jungle Spirit but there is a scatter and that’s represented by a pink flower. As the reels spin you will notice that some of the symbols have a small glowing butterfly attached; if that symbol contributes to a winning combination it will expand to fill the whole reel. This can happen in the base game and free spins. This can occur randomly in the base game and you will see butterflies fly around the screen, landing on symbols which are part of a winning combo and expanding them to fill that whole reel (not unlike the symbol expansion described above). The animal you choose will be the only high value symbol on a set of reels with an extra set of rows and therefore 1024 ways to win. The option you choose depends on whether you prefer higher risk/reward with the tiger scaling down to lots of low value spins with the cobra. It’s not possible to trigger any more spins from within this round. 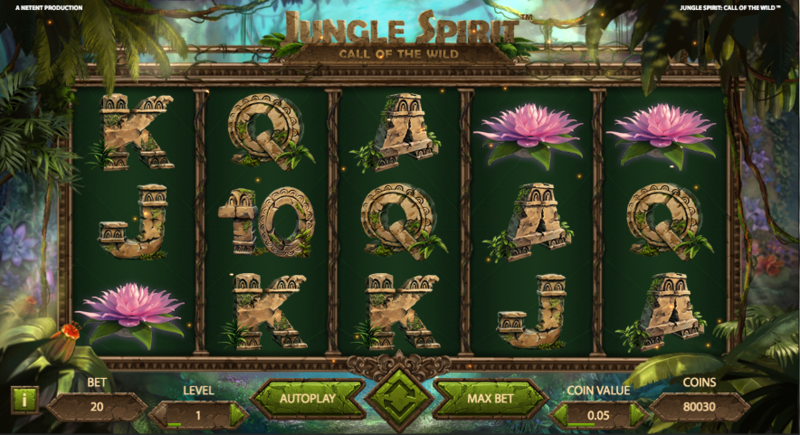 Jungle Spirit is a superb-looking slot from Netent with lots of highly detailed graphics and animations; it has three enticing features, an RTP of 96.47% and it’s definitely worth checking out.